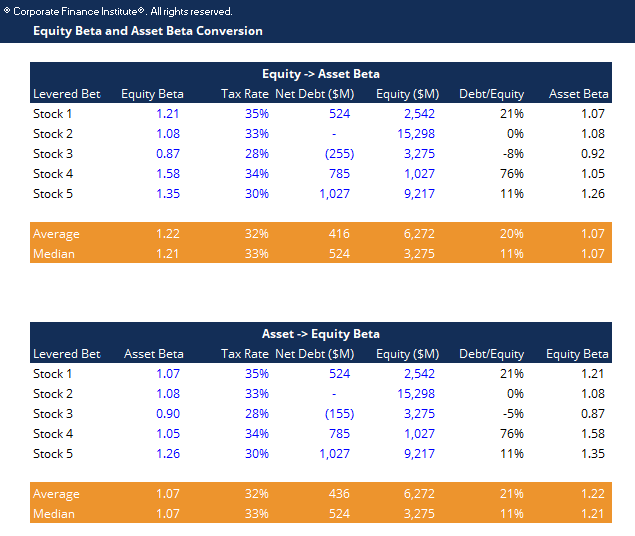 This equity beta asset beta conversion template allows you to convert between equity beta and asset beta. Unlevered beta (or asset beta) is the beta of a company without the impact of debt. It is also known as the volatility of returns for a company, without taking into account its financial leverage. It compares the risk of an unlevered company to the risk of the market. It is also commonly referred to as “asset beta” because the volatility of a company without any leverage is the result of only its assets. Levered beta (or equity beta) is a measurement that compares the volatility of returns a company’s stock against those of the broader market. In other words, it’s a measure of risk and it includes the impact of a company’s capital structure and leverage. Equity beta allows investors to gauge how sensitive a security might be to macro-market risks.